Gretchen's Rec: Smart, funny, satisfying, and heartfelt, this is a winning YA novel that manages to give its diverse teen characters plenty of room to be relatable and real without over-dramatizing them or feeling didactic. These kids grapple with a lot of issues, but this isn't an Issues book. Importantly, it's very much about kids who have already been living through tough concerns (the end of the world barely registers, after overbearing parents, mental illness, eating disorders, queerness, and of course, love). These are kids who love each other even though they're still figuring out what that means, who accept and support each other and *choose* each other every day. The contrast between their everyday problems against the backdrop of what's going on with the Chosen Ones (hilariously summarized events introduce each chapter) is pitch perfect. This is a good one if you loved Buffy and Harry Potter but are sick of investing in their many knockoffs. 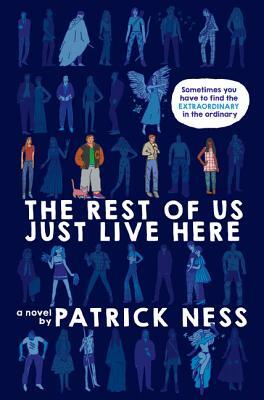 The Rest of Us Just Live Here by Patrick Ness, New York Times bestselling author of A Monster Calls and the Chaos Walking trilogy, is a bold and irreverent novel that powerfully reminds us that there are many different types of remarkable. What if you aren t the Chosen One? The one who's supposed to fight the zombies, or the soul-eating ghosts, or whatever the heck this new thing is, with the blue lights and the death? What if you re like Mikey? Who just wants to graduate and go to prom and maybe finally work up the courage to ask Henna outbefore someone goes and blows up the high school. Again. Because sometimes there are problems bigger thanthis week's end of the world, and sometimes you just have to find the extraordinary in your ordinary life.